Iranian Foreign Minister Mohammad Javad Zarif (R) and Russian Foreign Minister Sergey Lavrov (L) attend a press conference at the Russian Foreign Ministry's guest house in Moscow, Russia, on August 17, 2015. Recent visits by the Iranian and Saudi foreign ministers to Moscow, and simultaneous talks with Syrian opposition representatives, have raised speculation that Russia could be mediating between Iran and Saudi Arabia, with the lifting of sanctions on Tehran likely to leave the West Asia situation in a state of flux. 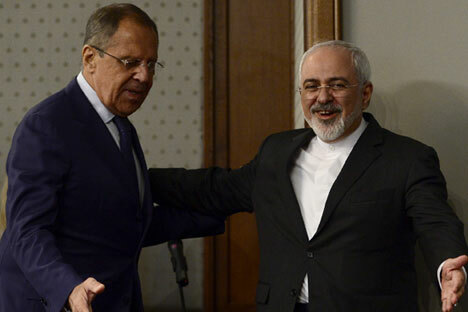 Russia’s Foreign Minister Sergei Lavrov met his Iranian counterpart Javad Zarif recently in Moscow to discuss how best to develop their bilateral ties in the new geopolitical environment, after Iran and the P-5+1 countries signed an agreement on Tehran’s nuclear programme. On the eve of Zarif’s visit to Moscow, Saudi Foreign Minister, Saud al-Faisal, and representatives of the Syrian opposition also arrived in the Russian capital for discussions. Opinion is divided on whether Moscow is acting as an unofficial mediator between Tehran and Riyadh to try and resolve the Syrian crisis. Lavrov and Zarif met on August 17 in fundamentally new international circumstances, after the signing of an agreement between Iran and the U.S.A, Russia, China, Britain, France (P-5) plus Germany will enable lifting of longstanding UN and Western sanctions on Tehran. A key topic of the discussions concerned implementation of the Plan of Action on Iran’s Nuclear Programme. Russia will play a crucial role in the implementation of the plan, by removing Iran’s stockpiles of low-enriched uranium in exchange for natural uranium. Moscow will also assist in developing the production of stable isotopes at the Iranian nuclear facility in Fordow. Russia will also build another eight atomic power reactors in Iran. “This is a very promising and significant direction, which will increase the supply of energy in Iran, while at the same time ensuring full compliance with non-proliferation, and also respecting Iran’s right to have a peaceful nuclear program,” said Lavrov. Another major topic of the meeting was the situation in West Asia. Asked about Russia’s position on the future of Syria’s President Bashar al-Assad, Lavrov said Moscow’s position remains the same as it was at beginning of the crisis; that the fate of the Syrian president must be addressed by the Syrian people after the crisis is resolved. “We have always advocated that the fate of Syria should be decided by the Syrians themselves – without outside intervention, without any preconditions, without any quick fixes being imposed by external players, from anywhere in the world,” said Lavrov. Javad Zarif noted that the positions of Iran and Russia coincide on this point. “The only way to solve the Syrian crisis is through political dialogue,” he said. Backroom deal with Saudi Arabia? Shortly before Zarif’s visit, (on Aug. 11 and 14, respectively) Moscow was visited by the Minister of Foreign Affairs of Saudi Arabia Adel al-Jubeir and representatives of the National Coalition for Syrian Revolutionary and Opposition Forces. This gave grounds to rumors of a possible mediation role being played by Moscow, which has repeatedly stated its desire to reduce tensions in the region arising due to events in Syria. According to him, Saudi Arabia is simply unable to agree on anything with the Iranian Shiites due to religious differences, and hence, in principle, Russia cannot act as a mediator. However, Andrei Baklanov, former Russian Ambassador to Saudi Arabia, and now deputy chairman of the Association of Russian Diplomats, did not rule out the possibility that Moscow is trying to ease tensions in Saudi-Iranian relations. Nevertheless, he believes that Russia currently does not have sufficient resources to act as an intermediary between Iran and Saudi Arabia. “Yes, in the future, under certain circumstances, this should be possible, but the required conditions for this do not exist at the moment,” said the former diplomat. He added that Russia would certainly like to see a reduction in the level of tensions in the region: “Russia proceeds from the point of view that relations between the two key players in the region should not be directed at confrontation – and so our country’s leadership is taking the appropriate measures.